Meanwhile, everyone is celebrating what would have been John Cage’s 100th birthday, including these 33 musicians (whose insights, er, vary) and the Guelph Jazz Festival this weekend. To hold your own celebration, perhaps you should turn your phone-devices into prepared pianos or read Kyle Gann’s lovely little book about “the silent piece” (pointedly titled No Such Thing as Silence), or watch this BBC doc wonderfully called Here’s a Piano I Prepared Earlier (not just about Cage but about the 1960s notational avant-garde in general). Chris: My tea is all Cagean too, though not in the sense that you could play it as an instrument. 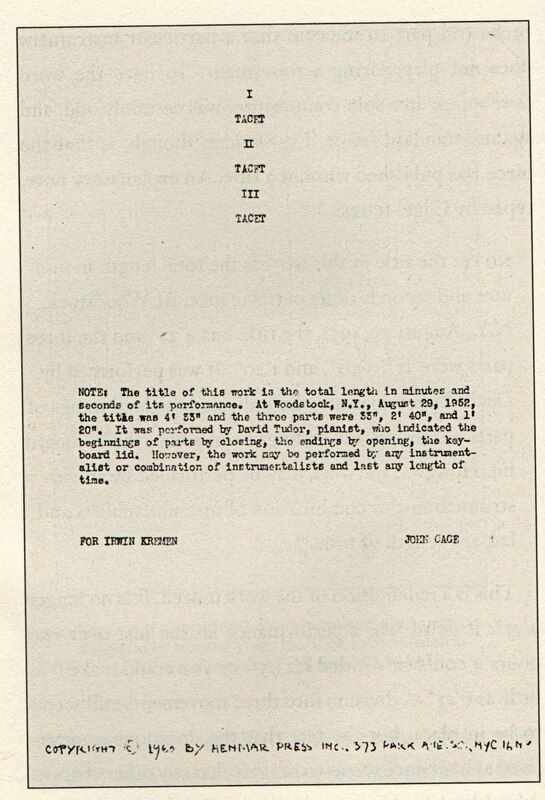 Here is the “inventor of genius” (as Schoenberg put it, while unfairly dissing his compositional abilities) talking about silence near the end of his life; discussing collaboration, and sometimes approaching flirtation, with longtime partner Merce Cunningham; and distantly present in one version of the 4’33” score, below.